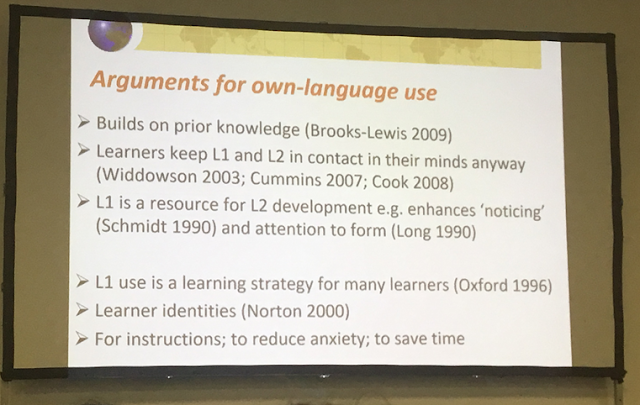 Graham Hall: Own-language use in the language classroom - why?, when? and how? 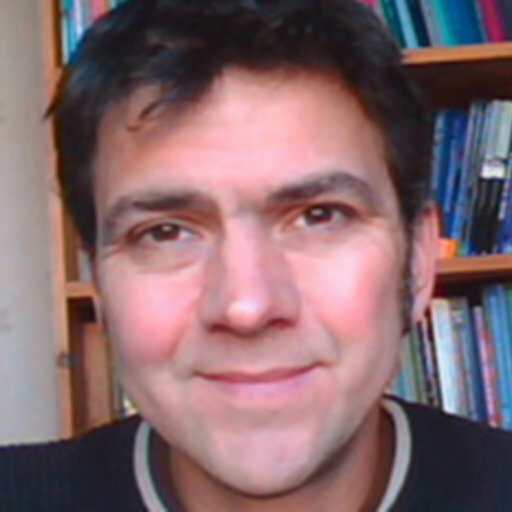 Graham Hall is Associate Professor in the department of Humanities at Northumbria University, UK. He was editor of the ELT Journal from 2013-2017. 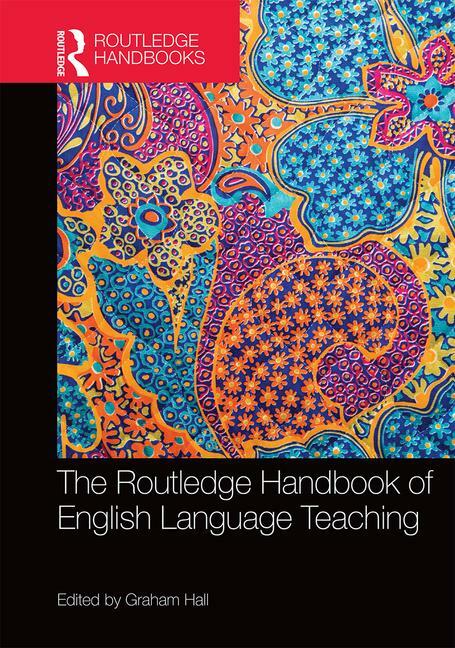 Recently published titles include: Exploring English Language Teaching: Language in Action (Routledge, 2nd Edition, 2017) and, as editor, The Routledge Handbook of ELT (2016). 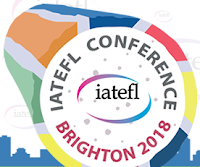 In her opening plenary at the IATEFL conference, 2018 (see summary here), Lourdes Ortega used the example of bi- / multilingualism to argue that research in SLA can sometimes challenge and disprove widely accepted assumptions about the practice of learning and teaching languages. She illustrated this by referring to the common belief that the learner’s first language (L1) can interfere with and inhibit the development of the Target Language (TL). Research has shown that policies such as imposing a TL-only rule in class can actually be detrimental to learning. At the end of her plenary, she highlighted talks on the programme that attempted to address this misconception, one of which was Graham’s talk on own-language use. Graham started the talk by clarifying a point of terminology. He considers that using the expression ‘L1’ is problematic, as the language that our students use in the community or in the classroom might not actually be their L1. The world is changing and learners may actually be multiple-language users. He therefore uses the term ‘own-language’ rather than ‘L1’. Graham pointed out that there has been a ‘monolingual assumption’ in mainstream theory and practice since the 19th century, which foregrounds TL use and immersion for language learning. 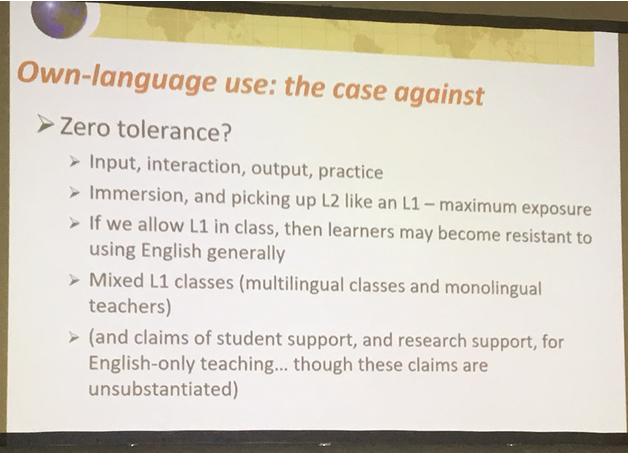 The slide below summarises some of the arguments in favour of excluding the learners’ L1(s) in class. However, there is actually no evidence to support the arguments against own-language use in the classroom and, in fact, research seems to indicate that the opposite may be true. Current literature is reassessing the role of the learner’s existing languages in the acquisition of an additional language. 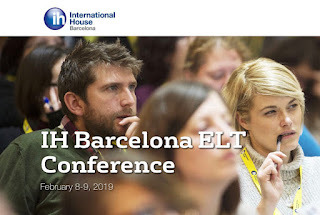 The situation in real classrooms is that..
- learners switch between languages in a way that is natural and spontaneous and meets their communicative needs (code-switching, translanguaging). ‘While … the learners in their minds keep the two [languages] in contact, …. 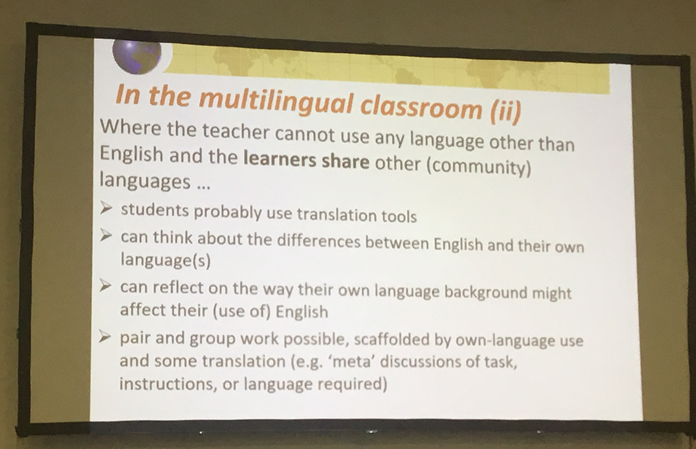 in the classroom the teachers try to keep the two languages separate. (Widdowson, 2003: 150). - Socio-cultural theory advocates scaffolding new learning onto existing knowledge. - Cognitive approaches contend that languages co-exist in the same mind, e.g. ‘multicompetence’ (Cook, 1991). Common underlying proficiency: ‘the transfer of cognitive / academic or literacy-related proficiency from one language to another’. Therefore, the two languages actually support, rather than compete with each other. 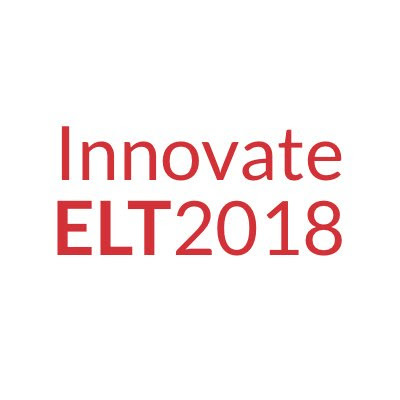 - ‘Traditional SLA’ theories such as ‘noticing’, ‘focus on form and forms’ and research into language and vocabulary learning strategies seem to support the interaction and analysis of the two languages. Own-language use in the classroom can have a number of pedagogical functions, which Graham elaborated as a set of goals (see below). 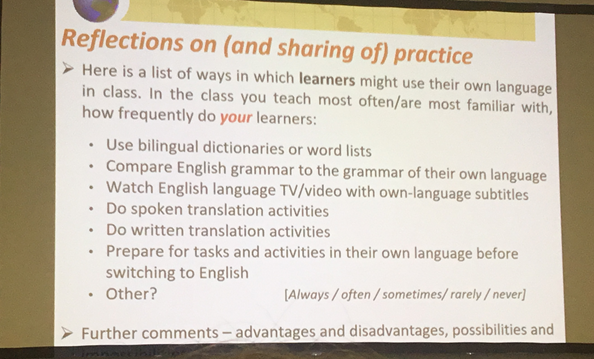 Graham pointed out that while the use of learners’ own-language is becoming more widely integrated into classroom practice, teachers are still unsure about how much L1 use is considered ‘acceptable’. 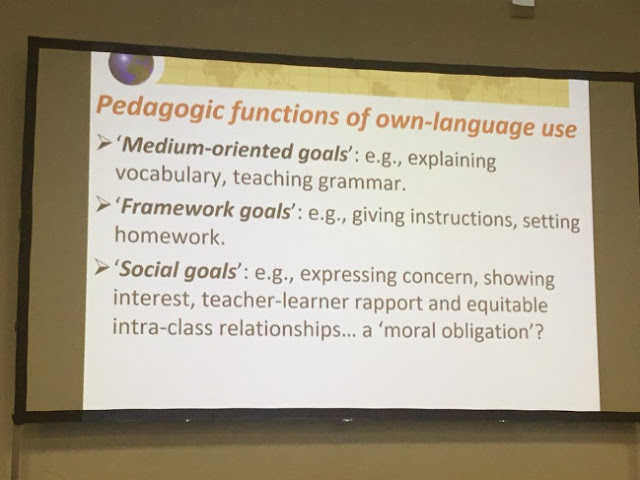 We often hear the adjectives ‘judicious’, ‘appropriate’ or ‘optimal’ used to describe own-language use in the classroom, but without any clear guidelines as to what that might be. As a result, teachers might be making up arbitrary rules. Yet again, as in the case of error correction, the argument seems to be that teachers are best placed to decide for their own classrooms (Macmillan & Rivers, 2011). - Sandwiching: Inserting brief own-language translation into the discourse, followed by English-language translation. Brooks-Lewis, K. A (2009) Adult Learners’ Perceptions of the Incorporation of their L1 in Foreign Language Teaching and Learning. 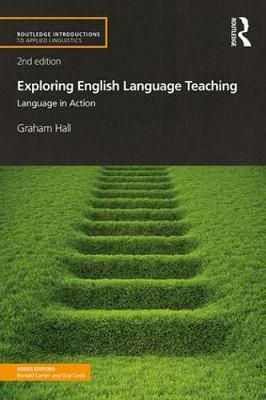 Applied Linguistics, 30 (2), 216–235. Cook, V. J. (1991). The poverty-of-the-stimulus argument and multi-competence. Second Language Research, 7, 2, 103-117. Cook, V. J. (2008). Second Language learning and teaching, 4th ed. London. Hodder Education. Cummins, J. (2007). Rethinking monolingual instructional strategies in multilingual classrooms. Canadian Journal of Applied Linguistics (CJAL) / Revue canadienne de linguistique appliquée (RCLA). Vol 10 (2). Long, M. H. (1990). The Least a Second Language Acquisition Thoery Needs to Explain. Tesol Quarterly, 24 (4), 649-666. Macmillan, B. A. & Rivers, D. J. (2011). 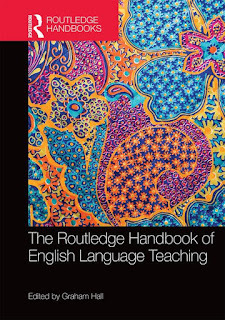 The practice of policy: Teacher attitudes toward “English only” System, 39, 251-263. Norton, B. Identity and Language Learning. Harlow, Longman. Oxford, R.L. (1996). Language learning strategies around the world: Cross-cultural Perspectives. Manoa: University of Hawai’i Press. Widdowson, H. G. (2003). Defining issues in English language teaching. Oxford, England: Oxford University Press.